The nice thing about being with someone who has been a bachelor most of his life is that we can live somewhat autonomously. That is, he does his thing. I do mine. We don’t nag about when the other is coming home, or synchronize what we’re going to eat for dinner. If we’re hungry, we eat. If I want to cook I do, and if he wants to cook . . . um . . . he brings home takeout. But sooner or later , just like every other couple, we need to plan and compromise, and that takes communication. The measure of a great communicator is how well she is understood, not how well she is heard. Talking louder will only get you heard. Real communication will get you understood. 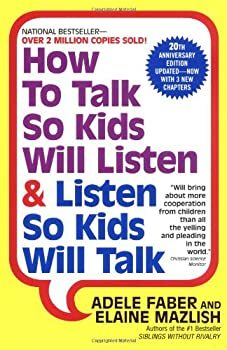 My favorite book on relationship building is How to Talk So Kids Will Listen & Listen So Kids Will Talk by Adele Faber and Elaine Mazlish. It is, of course, marketed to parents, but I say the title should be How to Talk so ____ Will Listen & Listen So ____ Will Talk. Readers can fill in the blank. They would have sold a lot more copies, and there would be a whole lot more people communicating. I’m serious. This should be on every business management reference shelf. After all, children and adults are all just people. No one wants to be ordered around or controlled. We want respect and freedom to choose. We all want to know that we are heard. The methods in this book absolutely work for all of your relationships. Either answer would have been fine. After all, she was my boss’s boss. But I knew as well as she that the inventory was a higher priority. In the end, she felt heard, I let her make a choice, and the work got done in the proper order. I also got to show her that I am a person who communicates. I could have told her “Sure, no problem!” then rolled my eyes and talked about her behind her back, but I chose to understand and be understood. Talking and listening. That’s communicating. The best things I learned about management I learned while parenting, and this book was a great resource. Another method of communication I like to use is to relate to people the way they relate to you. I try not to swear around people who don’t swear. If someone is very casual and calls me Hon, I have no problem calling them Dude. If someone is very straightforward, maybe even blunt, most likely they won’t want me beating around the bush. People who are in a hurry, will not want me babbling about the weather. And sometimes you need to talk in the language they understand. Not like French versus Italian . . . but especially in my home, I need to use language a bachelor can relate to. 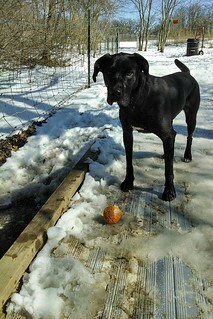 For instance, yesterday at the dog park, Sabbie wouldn’t take the new balls we found lying around. She only wanted to play with the ball we brought from home. Bubba didn’t understand . . .
Bubba: Why won’t she bring that ball back? Me: It’s not her ball. Bubba: But it’s just another ball. Me: She isn’t invested in it. It’s like when you meet a girl at the bar. Bubba: Ah . . .
Me: If you just bring her home for one night, you aren’t invested. But after you play with her a while, get used to the way she smells, and bounces, and snuggle up against her at night, you start to worry that you might lose her. So you don’t want to play with the other new girls. You’d rather stick with the one whose smell is familiar, even if she smells like dog slobber. Bubba: Oh yeah . . . that makes sense. Okay, maybe that didn’t come out exactly like I wanted to, but I got my point across. You see, to be understood, it helps if you know your audience. Good communication is the key to everything we do together as humans. The day I realized that we are not all on the on the same page by default and learned to ask questions to validate what others took away from what I said, and to make sure I fully understood what they expected from me, well that was the day my life took a permanent turn for the better. Your work example is one that I live just about every day myself and it is so bang on. I’m going to look up this book. The book is definitely geared toward parent / child interactions, but I’m sure it won’t take much imagination at all to use it anywhere. I love how you explained talking in the other persons language. I’ve always done that but would not know how to explain it. It’s like moving into the south and saying y’all. I can drop it anytime but when I with someone, I want them to feel comfortable. It helps to be a good listener first, then you pick up cues on how they communicate. Glad I got back to this one. Still catching up.